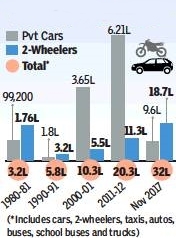 From 3.2 lakh registered vehicles in Mumbai in 1980-81, it took two decades for the vehicular population to cross the 10 lakh mark-—spanning the 1980s and 1990s—while it took just a single decade to cross the 20 lakh mark in 2011-12. 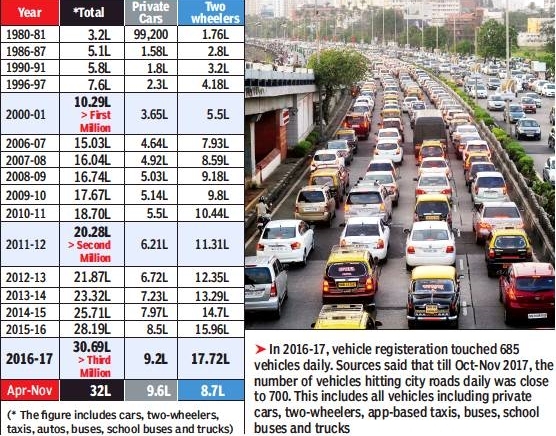 With easy EMIs for cars and a boom in production of new vehicles/two-wheelers, it took merely five years to add a million more vehicles on Mumbai’s roads. 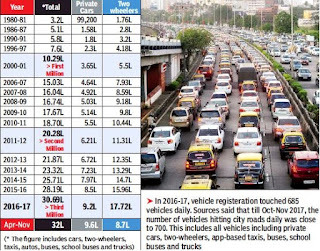 The city had nearly 32 lakh vehicles as of last November. Experts now fear that the gap between every extra 10 lakh vehicles on road is narrowing. Soon, it could take a mere two to three years to add another million vehicles in Mumbai and this could sound alarm bells for the city—where the road length has remained at 2,000 km for years, they pointed out. A study conducted by the Mumbai Environmental Social Network recently showed that the population of two wheelers, app-based taxis and school buses registered maximum growth in recent years. There will be a further rise in the number of bikes and scooters in Mumbai in the next few years, and this could also be “disastrous”—both in terms of having more traffic snarls and incidence of mishaps. The app-based taxis (Ola, Uber) have grown from zero to 45,000 in just four years, he said, although further growth was not expected in a big way. The study further revealed that app-based cabs made maximum trips—around 12 trips per day—as compared to four to five trips by kaali peeli taxis and two trips by privately owned cars. As for school buses, there were just 700 in 2000-01 and now it is more than five times—3,775 in Mumbai. Experts said there is a need to limit the entry of vehicles on roads or put some kind of restrictions on new registrations. In London and Singapore, the Metro has reduced the burden of private cars and encouraged mass rapid transport system. With roads bursting at the seams with a burgeoning vehicular population, parking has become a major concern. The number of vehicles hitting city roads daily is close to 700.